The Central Army Sports Club (CSKA) has won major international championships in the widely popular sports of soccer, basketball and hockey. Legendary Russian athletes tell RIR why they feel they owe their success to this long-lived club. The army club traces back its history to 1923, when the Skiing Amateur Association organized an experimental military sports site. It became the first centralized Red Army organization. April 29, 1923, is considered the club’s birthday, as it held its first sporting event on this date – a Moscow championship football match between army teams. In 1928, the organization and its entire infrastructure became part of the Central Red Army House. In 1953, the Defense Ministry Sports Club was formed, which included the sports facilities of the Central Red Army House and the Air Force of the Moscow Military District. The club received its current name in April 1960. CSKA is the only club in the world whose teams have won major international championships in three of the most popular sports: soccer, hockey and basketball. Viacheslav Fetisov – a CSKA legend, two-time Olympic champion, seven-time world champion, two-time Stanley Cup winner, multi-time champion of the Soviet Union and current government official – told RIR about his attachment to the army club. “CSKA is my second home,” said Fetisov. ”I first went there when I was 10, and I consider it a stroke of good luck. I think it is a fantastic club, which led Russian sport into a victorious vein." “For me, CSKA means a colossal tradition, great victories, great names of athletes and coaches, and a training approach that delivered results in all sports. It does credit to our country," he explains. "Thanks to CSKA, I could play in the NHL and win in key hockey tournaments all over the globe. CSKA has a great past, but I am sure it has a still greater future,” Fetisov said. Soviet and Russian basketball player Sergei Panov – who played for CSKA for more than 10 years and has worked as a CSKA official – spoke about the continuity between generations of army sportsmen. “CSKA is one of the most powerful sporting societies in Europe and, possibly, in the world,” he said. 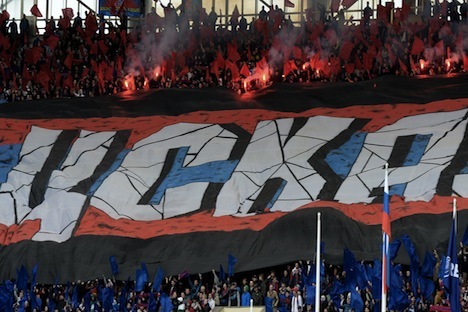 “What makes the CSKA club priceless is its cherished traditions," Panov said. "I am proud that I have not only played in the CSKA basketball team, but have worked for the army club." "I have rooted for all the army teams – basketball, football and jockey – since I was a child. I am happy to have won 10 gold medals in the Russian championship and gold in the Euro League, the main basketball tournament,” Panov added. Anna Chicherova, high jump champion of the 2012 London Olympics, silver medalist of the 2008 Olympics and high jump world champion told RIR that it was the army club that brought out her champion potential.